Thanks to everybody who participated this year!!! We’ve added the latest OCMPOA newsletter to the website. Click here to check it out…read all about this year’s Holiday Lighting Contest! Thanks to everybody who attended the annual meeting this year! And thanks if you renewed your annual membership or perhaps just joined OCMPOA. Your board looks forward to serving you this year. We will keep you posted of any events or changes as the information becomes available. We have two new board members to introduce: Beverly Hetrick, who will serve as Secretary, and John Van Mater, who will serve as an at-large board member. Kelle Villarreal has stepped up to take the Treasurer position. We’d like to extend our thanks to Temple Gossett for her board service. Here’s info about the upcoming annual meeeting….a little different this time…keeping it in the neighborhood! We have a new OCMPOA newsletter to share with you! Click here to check it out…. Click here to view the latest newsletter from the Travis County Sheriff’s Office! The latest issue of the OCMPOA newsletter is online now. Click here to view it! We are looking for someone that is interested in playing doubles several times a week. The age is irrevelant and can be female/male, and we can play at the Akins High School courts or on the court at 13102 Easley Drive, Manchaca, TX. Circumstances determine whether we play in the morning or afternoon. Please call Louis at (512) 282-3335 or (512) 796-4329. Saturday, June 3 at 7:30 am is set for what has now become a biennial Onion Creek Meadows event. In case of rain, the sale will be postponed to June 10th. Each household is encouraged to participate by selling your unwanted items from your own driveway. Several publications such as the Statesman, Austin Chronicle, Hays Free Press and Craigslist will carry advertising in the preceding days. We now have sharp-looking signs that will be posted at intersections along Old San Antonio Rd, Twin Creeks, 1626, and Buda nearing the neighborhood. Start collecting your items now and spread the word! Love this rain but cross your fingers for a dry garage sale! OCMPOA Board member Lance Farley met with Bear Creek Crossing contractor Royce Rippy and 204 Turley Dr. (currently vacant lot) owner Jarrod Gaither to discuss the impending development bordering our neighborhood to the north and the emergency access road connecting to Turley Dr. that Travis county has asked for. Lance learned that construction will begin on the development in about 30 days. There will be a second phase of the development begun in about 18 months that will include lots backing up to our northernmost Turley Drive properties. The emergency access road will be built on the half of the previously-vacated easement included in Mr. Gaither’s property and will be approximately 25-30 feet wide. The road is supposed to be gated and locked at the north end (bordering Bear Creek Crossing) and is only to be used for emergency vehicle access to Bear Creek Crossing. Lance received assurance from Mr. Rippy that Bear Creek Crossing construction vehicles would not be using the road. Mr. Rippy also stated that Bear Creek Crossing’s HOA would be responsible for maintenance of the road. A more complete plan of the development, showing the bordering to our neighborhood, can be found by clicking here and scrolling down about halfway through the .pdf. Once the emergency access road has been completed, Mr. Gaither plans to build a home on the 204 Turley lot and put it up for sale. Again, as further details are known, Lance will update this website with them. Annual Meeting time! Join your neighbors for an opportunity to stay informed and make decisions about our community! The new OCMPOA newsletter is out! Click here to view/download it. The Travis County Zoning & Platting Commission met Tuesday, February 21st, and the Bear Creek Crossing construction plan was submitted for approval. It passed. The development is slated to be directly north of and bordering Turley Drive. Click here to view the complete meeting agenda. Click here to view a copy of the construction plan, along with the county’s findings. Board member Lance Farley will continue to update the website concerning the progress of this development. 2/14/2017 – Welcome to the new OCMPOA website! Board member Lance Farley talked with Joe Arriaga, the county case worker for the development last week. Mr. Arriaga said that Royce Rippy has submitted the construction plan, and the plan is going before the Zoning & Platting Commission at their meeting Tueday, February 21st. 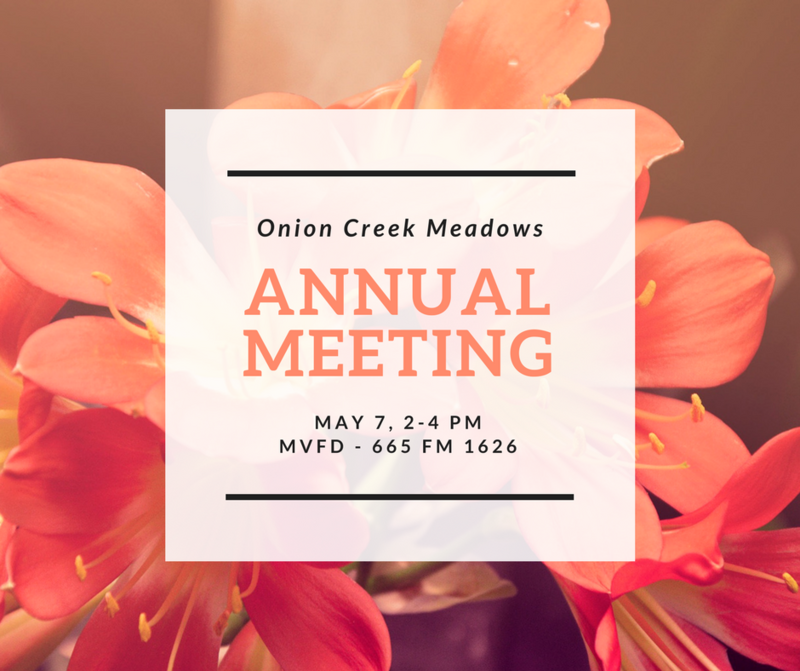 The meeting is open to the public at 301 W. 2nd St.
Bear Creek Crossing is a development slated for the 70-acre property between Twin Creek Road and Onion Creek Meadows to the north, bordering our Turley Drive properties from 208 Turley Dr., west to Onion Creek Drive. Click on the links below for previous updates given to us by our neighbor, Ron Ralph…who was keeping us updated on the situation. Thanks, Ron! The OCMPOA Facebook page is up and running! You can find it at www.facebook.com/ocmpoa OR by clicking on the above image. 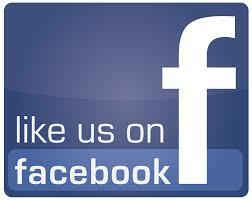 If you “like” the page, you’ll receive all updates in your feed. This is a great place to share news, photos, events, etc. with your neighbors as well as keep up with news from the Board. 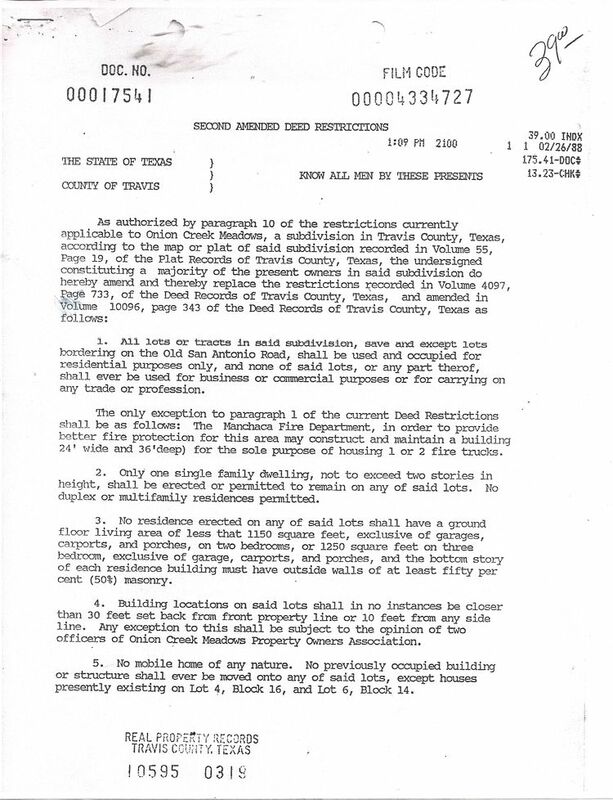 TIME TO RENEW YOUR MEMBERSHIP IN THE ONION CREEK MEADOWS PROPERTY OWNERS ASSN. IF YOU ARE NOT A MEMBER PLEASE JOIN US. SHOW YOU CARE ABOUT THE FUTURE OF THIS AREA. WORK WITH US TO PROTECT OUR QUALITY OF LIFE. THE DUES ARE $20.00 AND THE MEMBERSHIP PERIOD IS FROM JULY 1, 2016 – JUNE 30, 2017. If you are interested in reporting or receiving information about unusual or suspicious activity in the Onion Creek Meadows area, be sure your email address is on ocmpoaalertlist@gmail.com. 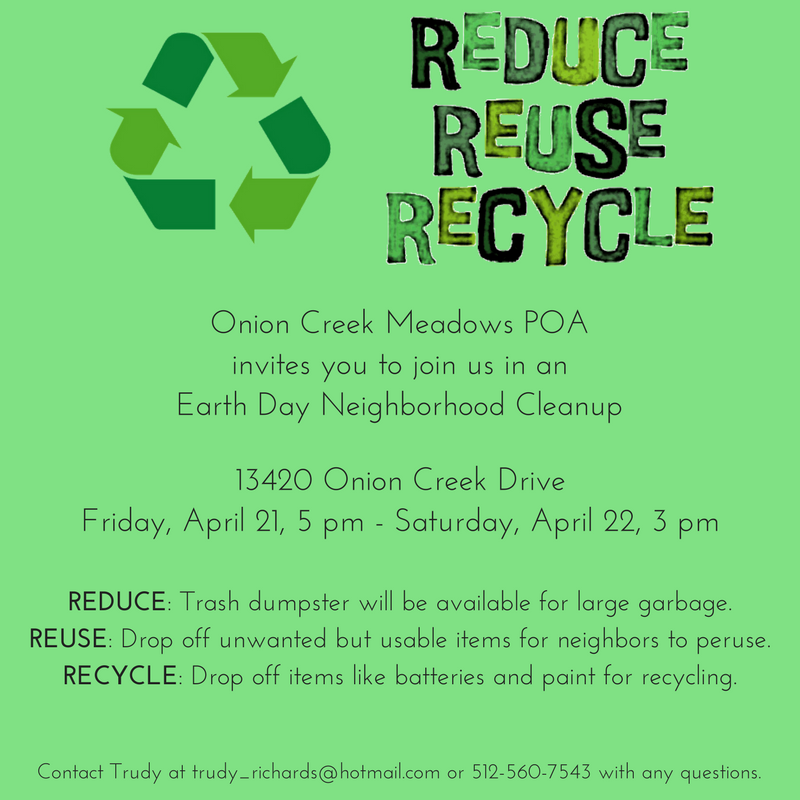 This is a free service available to anyone living in Onion Creek Meadows. Your email address will not be shared with anyone else. This form is one that the Sheriff’s Office uses to inform Patrol Officers when residents in their patrol area are out of town and to keep an eye on their property. Once submitted, Karen Valdez of the Travis County Sheriff’s Office will contact you to confirm details. 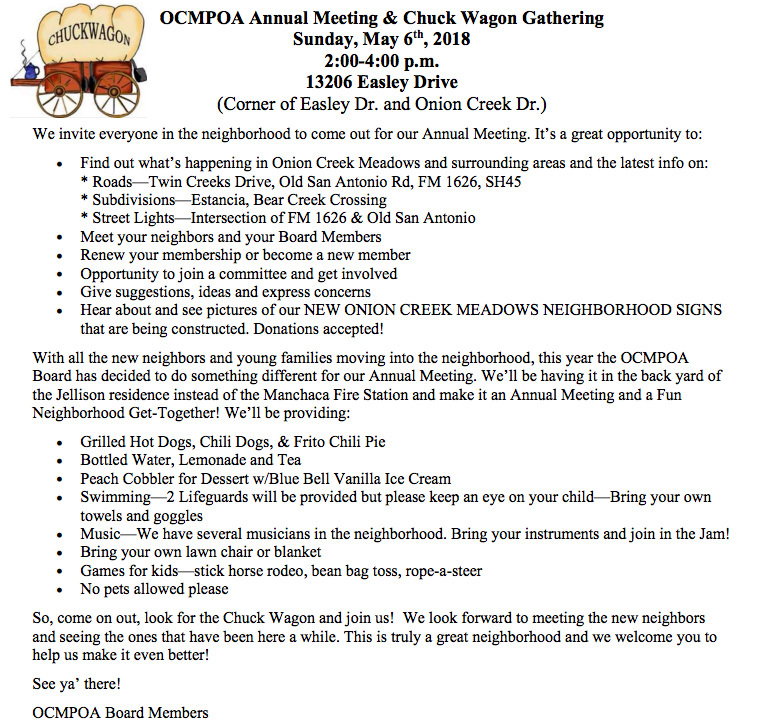 Onion Creek Meadows Yahoo Group: Neighborhood Forum! 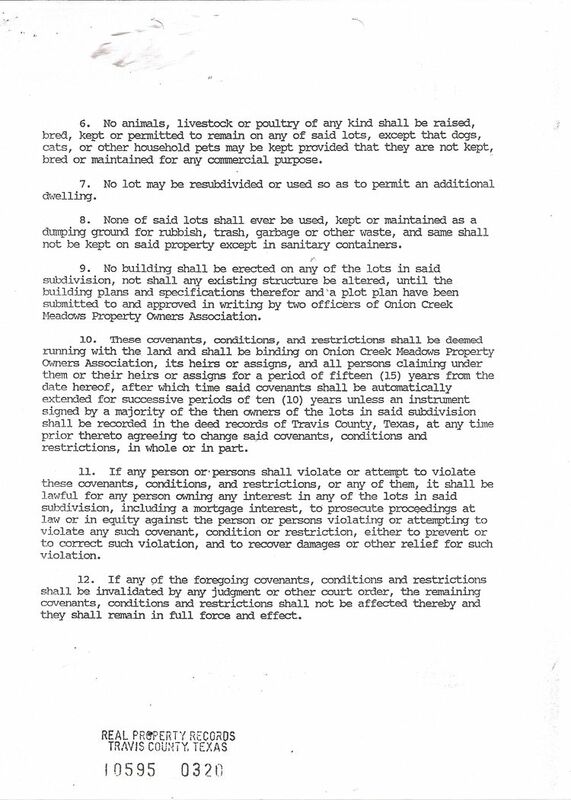 Copyright © 2019 Onion Creek Meadows Property Owners Association (OCMPOA). All Rights Reserved.